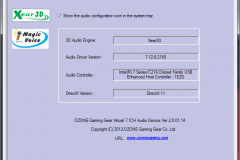 The 7HX is pcgamers.net.au first foray into OzoneGaming equipment. Up until this year, we’d never even heard of Ozone Gaming as their presence in Australia is not existent… well, not yet anyway. 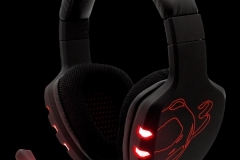 We have with us Ozone Gaming’s latest mid-range gaming headset: the Rage 7HX. 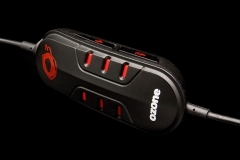 Upon reading the specifications, immediately its apparent the class of equipment Ozone are trying to produce and the market they want to penetrate – an affordable, quality, no B.S pro-gaming equipment market. The 7HX is an agressively styled, gaming headset built for long sessions. Comfort is top priority and to achieve this goal an ergo design and lightweight form factor is paramount. The headset features 40mm drivers, detachable microphone, extra-long USB cable length, large mesh-cloth ear cups, and an in-line controller. Read on for our road test! First up, aesthetics. 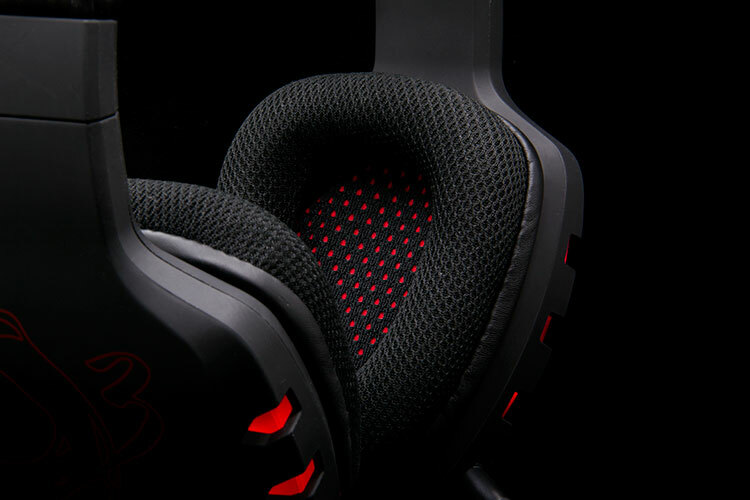 The 7HX sports a semi-rough matt-black finish with fluorescent red OzoneGaming markings on the side with three-red LED windows on each side of the ear cups. The ear cups are covered with a cloth mesh material and padded and the ergo design allows for extended sizing for larger headed players. 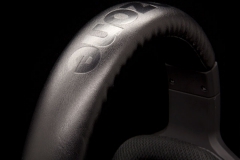 Ozone mention there is a reduction in background noise and whilst the unit is not touted as a total-noise canceller perse, the materials used do a do good job of drowning out ambient distractions. The microphone, which also supports a Red LED, is flexible and detachable. How does it feel? It feels very comfortable actually. I have a large head and my big ears fit neatly inside the cups. Having spent some time listening to tunes and laying games, I noticed significant ambient noise around me being reduced, not totally, but significant. I think the textured mesh-cloth used and the comfort level comes down to personal preference – some like mesh, some prefer leather – I personally felt the cloth was comfortable, not sweaty and was “cosy” around my ears. The faux-leather head-band padding is thick and heavily padded and also felt comfortable on top of my noggin and remained so after long periods of time. Whilst the ear-cups don’t swivel and are fixed into place, I didn’t find this an issue and the headset sat nicely; it wasn’t overly tight however, some might feel it a little loose (you might if your head is small) – I didn’t have a problem. Some reports also stating that the headset might actually come off during movement. So, aesthetics: Pass. 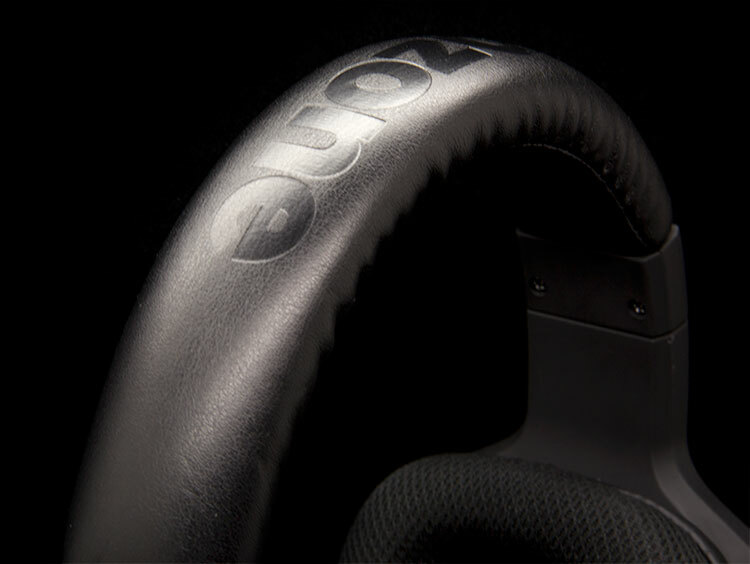 Comfortable for long periods, and good ambient noise cancellation. 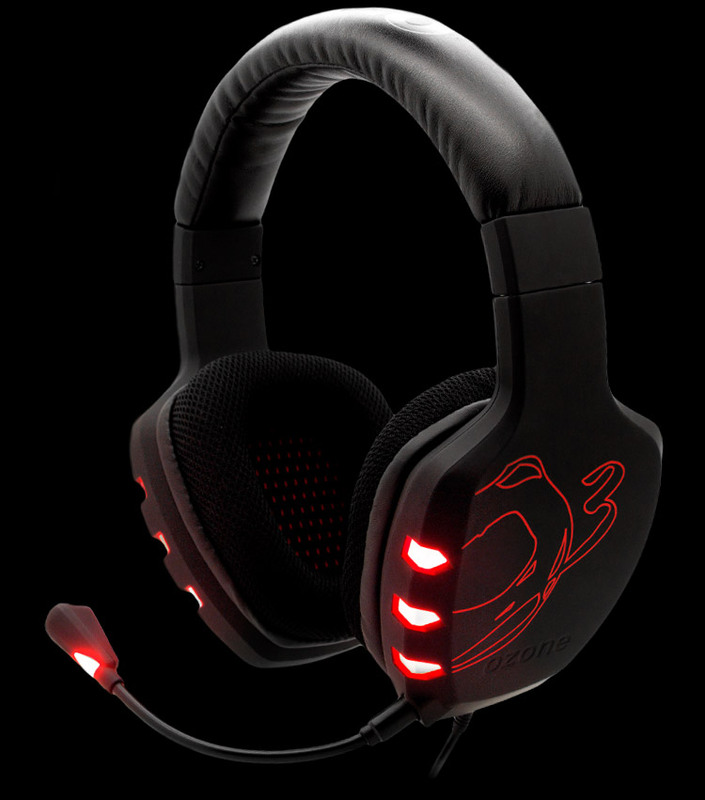 The look is certainly pro-gamer with the bright-RED LEDs so if you want to be seen, you will with this headset! 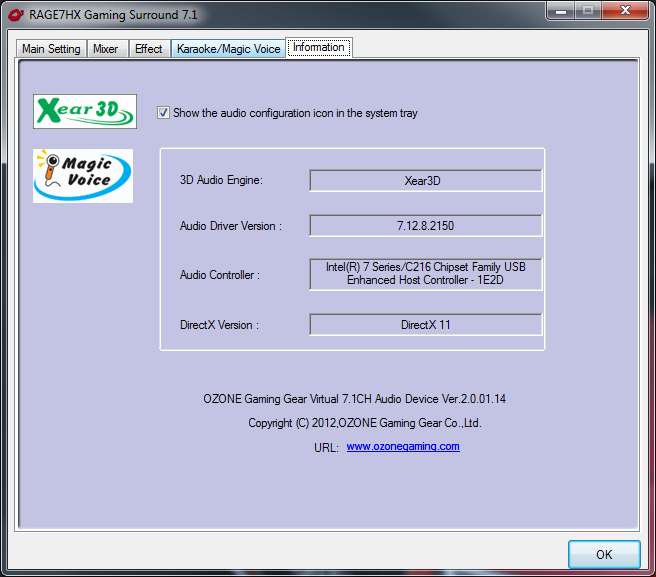 Because the 7HX is a 7.1 simulated surround sound USB headset, you’d expect some drivers and supporting application to be installed. If you expected it, you’d be correct – Ozone include an install CD with such that. The install was straightforward. 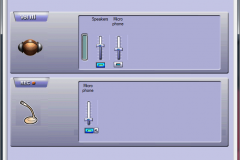 A small audio app icon will appear in your system try where you can change audio settings, enable virtual surround and customise your experience, if you’re so inclined to do so. We found the stock settings for 2CH and 8CH effective out of the box. 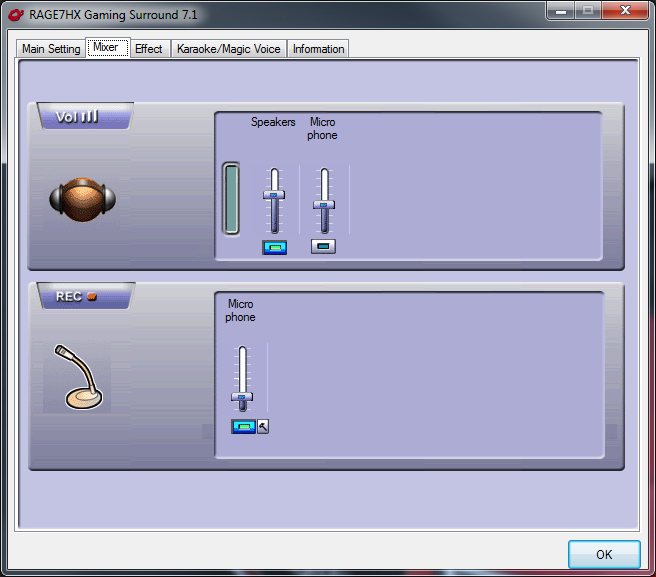 Lost with what audio setting to choose? 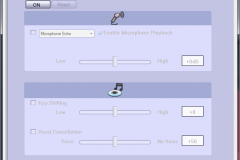 No problems – the app has a nice helping hand “question-mark” which indicates best use of the simulated sound changes – choose “blah” if you’re watching movies, choose “blah” if you’re playing games etc. I experimented a little with the “room size” which changes the spatial environment setting and I imagine changes the simulated delay from each “simulated” speaker. I ended up leaving the default settings. 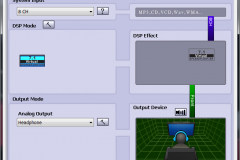 For audiophiles, (which I am not), the ability to change simulated surround settings for each virtual speaker can be achieved for that extra squeeze of granularity and customisation. 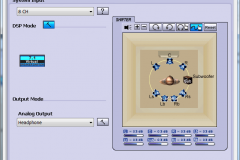 Some interesting features exist like being about to adjust the direction of the sound (which I can’t imagine a scenario for this) and being able to shift dB levels – if you want to do so, you can. 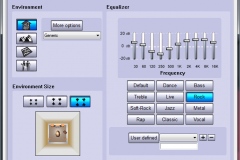 Changing EQ settings was a must for me – flat levels are just that and do nothing for the audio quality. I personally like the “Rock” preset which is rich and a good compromise with tone and bass. My gaming experience with EQ enabled was great – especially under Battlefield 3 where the sound was loud, rich and full of bass. 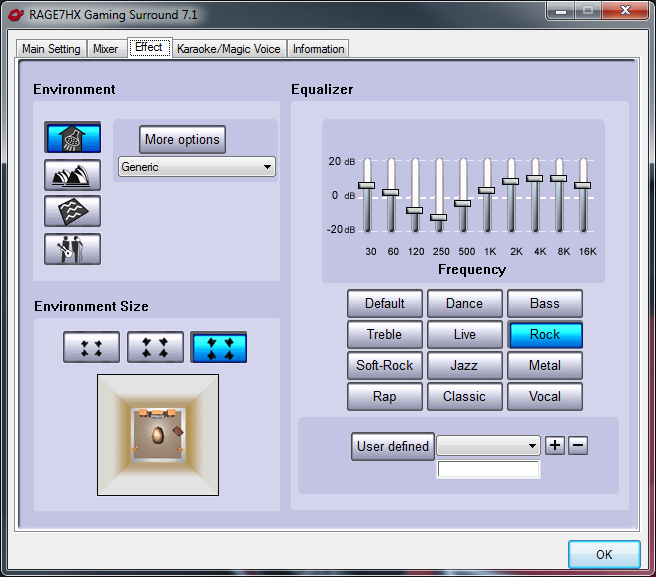 However, I did notice the EQ messed around with WinAMP’s EQ and I was forced to disable it to listen to music. 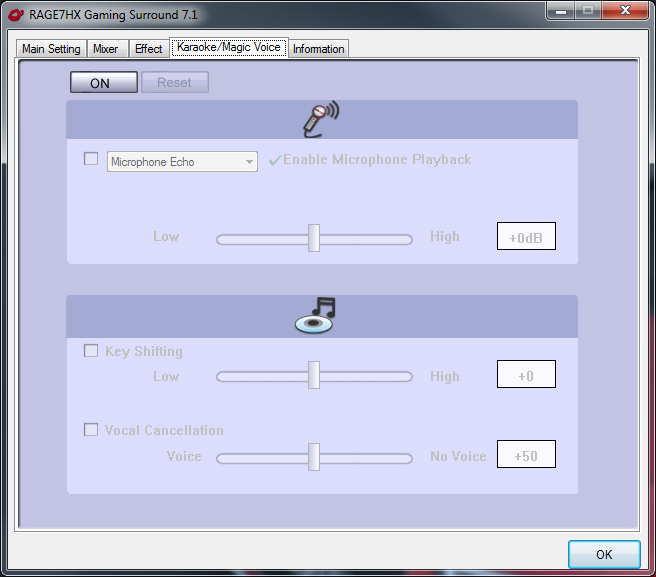 You can choose a room type which will incorporate different reverb make the sound echo-ey which IMHO never sounds good. I stuck with the default. Software: Excellent. More features than you can poke a stick at. Not buggy and sat neatly and unobtrusively in my system-tray. The interface was fast, not laggy, and whilst I was a little confused a little with what choices to make (I’m insinuating the client could be more intuitive) I made my way around without trouble. The microphone is flexible and detachable via a 3.5mm jack – it wasn’t invasive and sat far enough in front of my face to not notice it was there. Voice quality was excellent and noise cancellation seemed to work and eliminate ambient noise. I thought the RED LED at the tip was a cool touch. The remote control itself is fairly cheap in build quality and the plastics could be better – however for the pricing it can be excused. I found the buttons a little fiddly and the unit didn’t quite seem to fit ergonomically in my hand. What I did like about the muting function is once its pressed, volume is faded out and in as opposed to cutting the audio hard or blasting your ears on an unmute. 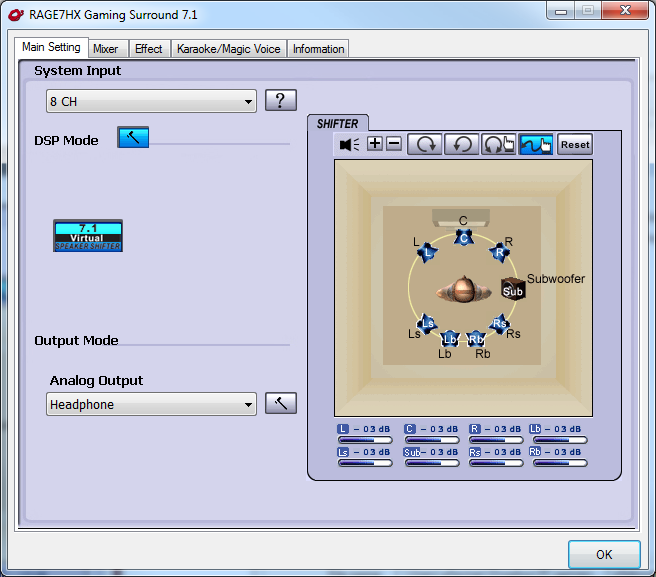 Personally, headset-based virtual surround sound is great for when a headset is needed and there’s no alternative; like at LAN parties or at home late at night. 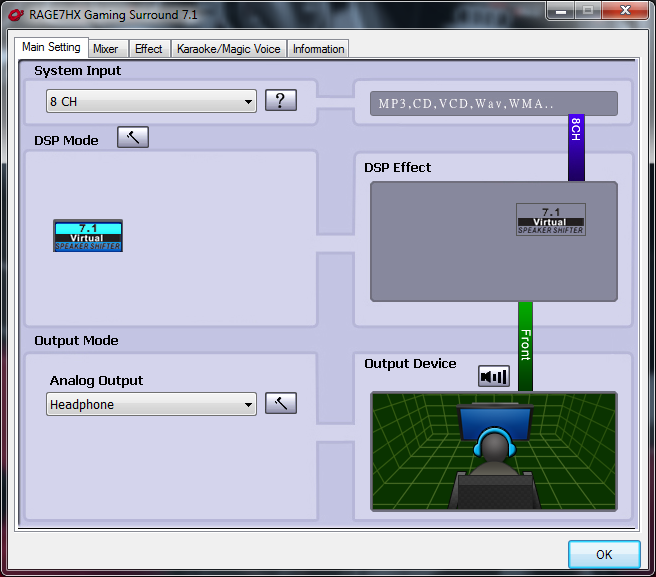 For true surround sound, its still very hard to beat a dedicated surround speak setup. Music and movies were very pleasing – rich, clear and loud music is how I like it and the 7HX provided enough to put a smile on my face. I tested various MetallicA, Black Sabbath and Kyuss audio tracks and the bass was pleasing as was the volume! My Art Blakey (for all you hip-cats out there) tunes sounded fab on Rock EQ setting too! Most enjoyable. Remembering, this headset retails for US$64.00 and for a sub-$100 headset, the overall result was far better than I expected. 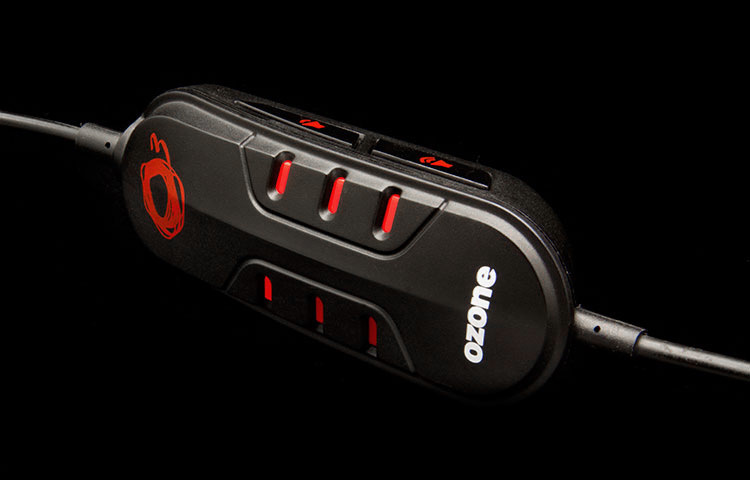 OzoneGaming gear will be new to most of us in Australia – and whilst this unit isn’t available right now, I suspect we’ll be seeing the brand participate in not only the headset space but also the pro-gaming landscape in Australia. The 7HX is a great headset providing the price remains near to the US RRP – yes, it has its shortcomings (poorly designed remote control, some might not like the mesh cloth ear cups, some might not like the non-pivoting ear piece) but the basics are there: audio quality, sturdy build and feature-rich audio client. Next articleSWTOR: The Battle for Makeb Has Begun!